simplicity, appropriate form, function (workability & beauty), economy of effort. SAFE design principles were the organizing principle of the modern design book “art: an approach”, by Robert C. Niece, 1959.
minimizing the risk of harm to people or the environment. Possible types of harm include physical harm (repetitive stress syndrome, electrocution), mental anguish (lack of privacy, negative self-attributions), and threats to property (fraud, vandalism). any system whose reliable performance is important for ensuring the health and safety of users and the public, including for instance, power plants, clinical systems, emergency response systems (police, fire), hazardous chemicals systems, and many military systems. a teaching technique where support tools help manage mechanics that would be difficult to master while the students learns higher-level concepts. the principle that as a user moves from screen to screen or web page to web page, there should be such consistency that the only things that change represent new information. a feature in telephone-based customer service applications that brings up a customer record automatically on the screen of the customer service representative when they receive a call. a system for zooming in on portions of the screen to make it easier for the visually-impaired to view information on computer monitors. Also called a screen magnifier. or screendump / screen snapshot / screen capture; a picture of a screen capturing the appearance of the user interface at a given point of time, typically a printout, but also including electronic snapshots. a small arrow at either end of a scrollbar that can be clicked to shift the view area of a document incrementally in one direction at a time. a box within a scrollbar that allows the user to move to a specific region by dragging the box to the appropriate location within the scrollbar. Also called a “scrollbox” or “thumb”. 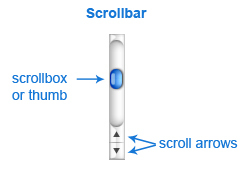 a box or “thumb” within a scrollbar that allows the user to move to a specific region by dragging the box to the appropriate location within the scrollbar. Also called a “scrollbox” or “elevator”. or scrollbar channel; the area of the scrollbar that is outside of the scrollbox. Clicking within the gutter pages up or down. a box within a scrollbar that allows the user to move to a specific region by dragging the box to the appropriate location within the scrollbar. Also called a “thumb” or “elevator”. a list of text items that can be scrolled, usually allowing one or more items to be selected. the mechanism that enables users to find things in large information spaces. Search issues fall into 3 common categories: how people specify their search queries, what determines a “relevant” match, and how search results are displayed. a box, also known as a marquee, that appears around a selected region, such as a rectangular area selected in a drawing program. a pointer in the shape of an arrow, used to select and drag icons and other graphical objects. the degree of translation required from a user’s conceived goal to the action needed to achieve the goal, based on how that action is supported by system features. and tactile defensiveness; an adverse reaction that some users may have to touching devices with certain temperatures, textures, or materials, which may be due to allergies, physical sensitivities, or psychological aversion. a user interface implementation that allows the user interface to be modified without modifying the backend code, and vice versa. a heavy line dividing items in a list, with possibly an item title and item controls (NewtonOS term). an interactive connection involving more than one person and including all of the objects that they are sharing. the mechanism for mediating which people and which objects can belong to a given interactive session. special interest group on computer-human interaction. A professional organization that operates as part of the ACM (association of computing machinery) that brings together academics, students, and practitioners to study HCI (human-computer interaction). SIGCHI sponsors the annual CHI conference. going to target users’ workplace to see how they work, interact directly with them, conduct interviews, and see their work artifacts. Interaction can range from directly interviewing to inconspicuously observing. Visits can be brief or long-term. alternative look and feel for the same application that can be swapped by the user, especially window styles and button styles, enabling highly personalized artistic styles in the user interface. Sometimes called chrome. SUI; design for extremely small output devices such as cell phone displays, watches, car radio displays, and other small information appliances. a key whose label is specified in software, as in ATM machines and mobile phone interfaces. difficulty in spoken language, whether through vocalization or articulation impairments or through neurological language disorders. Computers can facilitate communication for people with speech difficulties. The field of study examining this is called AAC — Augmentative and Alternative Communication. a type of voice-recognition system – it converts spoken language to text. Useful for text entry and command entry, especially for people whose hands are busy with other tasks and for people with motor impairments. a metric for human performance. How quickly does a person react to a stimulus (reaction time)? How much time does it take for someone to perform a given task (task completion time)? a widget for input of numbers, consisting of a text entry field that allows only numbers to be entered and 2 small up and down arrows for increasing and decreasing the value. a line separating two panes of a split window. A split line can be dragged to the edge of a pane to eliminate the pane. an image used as an illustration or decoration on a page or on the screen, generally without a functional purpose other than its visual appeal and dynamics within a layout. evaluating a graphic layout by squinting your eyes. This tests legibility and whether the overall layout is a strong, clear layout. in animation, the choice of composition, viewpoint, and acting to communicate most effectively without confusion, distracting details, or tradeoffs that sacrifice clarity. a design review to determine whether a user interface design conforms to standards, whether broad industry standards, corporate standards, or standards specifically designed for a given project (e.g. conformance to a style guide). a visual representation of a series of “states” and transitions between those states, useful for modeling a wide variety of simple programming problems. Also called a “state transition diagram” or “transition network”. a form of competitive analysis for design purposes. The idea is to find out how other systems have solved user interface design problems and adapt their solutions to your purposes. the perception of depth based on the differences in images that reach the 2 eyes. the quality of a website that it retains visitors, by keeping them at the website and by getting them to return regularly. opportunistic testing of an interface in a public location such as a storefront or other location where it’s easy to encounter target users because they are frequently in that location. links made available to navigate an information space by its structure & not necessarily specifically related to the content of the page they’re found on. a graphical way of representing layout constraints, used in some UIMS to handle the layout specifications for widgets. Struts and springs allow a programmer to specify minimum and maximum widths, proportions of the screen, alignment, and so forth. people used as a substitute or representative for users, in order to provide information in design meetings, user testing, and so forth. supporting a user community by maintaining their computer environment, by handling such items as system purchasing and installation, software configuration, network configuration, backups, server maintenance, security, troubleshooting, user training, maintaining system stability, and providing technical support for users.